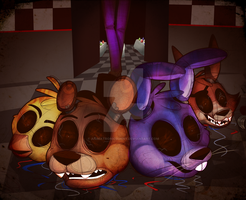 Recent print I did for FNAF. Let me know what you think! I love it!! I bought a print of it at Matsuricon!! Aww now I just want to jump in there a save them from their future. My heart hurts so bad. ...How is it that there are only 3 comments here ( not including mine ), 351 views and 47 faves? And in the span of 10 days?! Why is there not more?! Again, nicely done! And keep it up!! Loving the designs for them all C: They fit so perfectly! Is this what they actually look like?